Now that the phrase computer audio is a permanent entry in the audiophile lexicon, whats the next step? In my opinion, more high-resolution music must be made available to the consumer. Early adopters of the DVD-Audio and SACD formats waited for the music industry to issue and reissue music in the new formats, but it never happened to the degree it needed to. But then, music companies rarely released new recordings in any format other than CD. Why should this new computer-audio thing be any different? The reason is the Apple iPod. The iPod has changed the ways people listen to and store their music. According to Wikipedia, as of September 9, 2009, more than 220,000,000 iPods had been sold worldwide. This means that hundreds of millions of people now store their music collections -- at least, what they listen to day in and day out -- on their computers. Those people, regardless if theyre casual listeners or more sophisticated audiophiles, have already done most of the hard work. We are a built-in audience waiting to be served better sound. I store all of my music on an Apple MacBook Pro laptop computer. I went the Mac route years ago, after many rides on the PC merry-go-round that always ended in heartbreak. For my money, a Mac is a better-looking, more reliable computer than a Windows-based PC. (Apple also has better TV commercials.) From an audiophiles perspective, Apple s iTunes is great in that it can provide a bit-perfect digital datastream -- and if youre concerned about sound quality, bit-perfect is the name of the computer-audio game. A Mac is also pretty much good to go straight out of the box, whereas a PC would need to be properly set up -- a process that can be mind-numbing. To get the digital data out of a Mac, Apple provides three different outputs: Mini-TosLink, FireWire, and USB. The Mini-TosLink is capable of outputting an audio file with resolutions up to 24 bits/96kHz. The FireWire output is capable of resolutions all the way up to 24/192. Finally, the USB 2.0 output is technically good up to 24/192 (as soon as there are devices capable of receiving this resolution via USB). This is where it begins to get frustrating. The Mac doesnt let you immediately follow playback of a "Red Book" (CD-quality) 16/44.1 track with playback of a 24/96 high-resolution track without your having to shut down iTunes, open the computers Preferences menu, change the Audio MIDI setting to the desired bit count and sample rate, then reopen iTunes. If you dont do this, then the selected music file will be up- or downsampled, depending on the files native resolution and the Macs MIDI settings. For instance, if you play a 24/176.4 track right after playing a CD-quality track, the Mac will output 16/44.1 instead of the tracks native resolution of 24/176.4. Resetting the Preferences breaks the flow of listening to the music and means you have to perform a process that takes at least as much time as removing a CD from a player and inserting a new disc -- which defeats the convenience of a computer-based audio system. Apple has not designed their Audio MIDI to automatically change sample rates because they dont want a single program, even their own iTunes, to be in charge of the audio output device. In the world of Apple, the goal set for the operating system is complete synergy, which is why they designed it to allow multiple applications to simultaneously send digital audio to the same output device. If iTunes were allowed to control and automatically change the sample rate of the output, some audio applications would crash. As complete synergy is the main reason buyers choose Macs over PCs to begin with, this possibility is unacceptable to Apple -- to the chagrin of audiophiles. Enter Sonic Studios Amarra computer playback system ($995 USD). Amarra is software designed to work on an Apple computer that makes the lack of an automatic sample-rate converter a problem of the past. Regardless of the resolution of the track you choose, Amarra automatically switches to the tracks native sample rate and sends that digital datastream to your D/A converter. The software also provides advanced dither settings and digital volume (as set through iTunes), plays all high-resolution PCM formats up to 192kHz, uses iTunes for compressed and rights-managed music, integrates with Apple Remote and iTouch, and currently supports the Snow Leopard, Leopard, and Tiger versions of Apples OSX operating system. When I contacted Jon Reichbach of Sonic Studio to take a look at the Amarra software, he provided me with a link from which to download the software to my Mac. When I started it up, a warning message told me that the software would operate only in Demo Mode because the computer hadnt found an iLok Security Key, a USB thumb drive that stores the Amarras user license. Reichbach had set up a user account for me, but the iLok hadnt yet arrived. 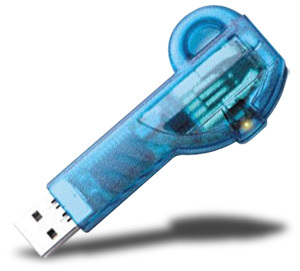 The iLok is available for $39.95 from the iLok website. Until the key arrived, I listened through the Amarra software in Demo Mode, in which there are periods of silence during a track and the sample-rate converter works up to only 24/96. For the most part, this was OK -- I didnt have a FireWire DAC on hand that could handle sample rates higher than 24/96, and the infrequent silences lasted only a few seconds. When the iLok arrived, I downloaded the Amarra license from iLoks website, inserted it in my Mac, and was ready to go. The Amarra audio engine takes the place of the iTunes engine to completely control a Macs digital audio output. On the computer screen, Amarra opens a small screen along the left side of the iTunes interface. At the top left of Amarras onscreen interface is a Power On button, and at the top right is an EQ Off button. Under those is a small info box that states the type of sound file (AIFF, WAV, etc. ), whether or not its in stereo, and its sample rate. Under that is listed the DAC being used (in my case, a Bel Canto DAC3). Finally, theres a readout for track time, buttons for Play, Forward, and Back, and a readout that shows the levels of the right and left channels. I could still fully navigate my music library via iTunes, but Amarra doesnt currently work for those who use Front Row, an Apple program that lets you browse the media on your Mac from across the room. Nor does Amarra currently work with Apple Lossless files, though Im told an update will fix that omission. To navigate iTunes, I used the Remote application, available for download to iPhone or iTouch, and found it much quicker than Front Row. Although its the main reason most people will buy Amarra, simple and automatic conversion of sample rates is not the softwares only feature. While listening to several tracks, I asked my girlfriend to help me in an A/B test. To avoid affecting the soundstage, she sat well behind the Rockport Technologies Mira speakers, and clicked the Power On button to toggle between Amarra and iTunes. (The preamplifier was a Simaudio Moon P5.3, the power amp a Class� CA2200.) I discovered that Amarra affects the sound in positive ways. I carefully listened to several tracks of the new remastering of Neil Youngs After the Gold Rush (Reprise 517936-2), and noted a slight difference in "Birds." About halfway through the song, Young repeats "Its over . . ." a few times. Through iTunes, his voice had a little grain; through Amarra, the grain was gone, leaving Youngs voice sounding smoother and more natural. Another track that demonstrated improvements was "Delia," from David Johansen and the Harry Smiths (SACD/CD, Chesky R 470334), which Id downloaded from Cheskys HDtracks website. "Delia" begins with acoustic guitar accompanied by bongos, and the latter have always been the focal point for me because of how realistically they "appear" in my listening room. Through Amarra, the skins of the bongos seemed a bit more fleshed out. The image was just as precise as through iTunes, but the slap of the percussionists hand was rendered with a little more impact. The differences were subtle, but thats what audiophiles pay big bucks for. Why does Amarra sound better than iTunes? Sonic Studio began in the mid 1980s as Sonic Solutions, which designed computer workstations for motion-picture and recording studios, major record labels, and high-end mastering facilities. They claim that more than half of the CDs commercially released have been mastered on a Sonic Solutions workstation, and in those nearly three decades, Reichbach has repeatedly been asked "Why does your workstation sound better than brand Xs?" After many years of asking questions of his engineers, Reichbach finally learned that its all in the math. His explanation sounds simple but is far from it: Not all algorithms used to process audio signals are equal. Some add more noise than others, and its the careful attention they pay to these algorithms that makes Amarra sound better than iTunes. The workstations based on Sonic Solutions algorithms back in the 80s laid the foundation of the Amarra software available today. The Amarra software provides a few other goodies that can make your audio system sound better. One of these is a single-band equalizer that can be used to boost a dip or reduce a peak created by room modes. The EQ settings are accessed by clicking the EQ button to the left of the Power On button at the top of the Amarra interface. From there you can adjust up to three frequency ranges. Select the frequency you want to treat, adjust the Q (bandwidth relative to the center frequency), then adjust the attenuation up or down to address a peak or dip. I found this useful. When I first received the Amarra software, Id just refinished my listening room and was fine-tuning the frequency response of its interaction with my speakers, but there was still a sharp dip at about 120Hz. I sent a screen shot of the response to Reichbach, who asked one of his engineers to analyze my graph and recommend an EQ setting for me: raise the null a few dB, just enough to fill in that hollow spot. It worked great. While the measurements told me that it hadnt entirely eliminated the dip, it sounded natural and completely transparent, and thats whats important -- and something I cant say about most EQs. Then theres the Dither setting, accessed via the Windows dropdown menu at the top of the Macs screen. Click on Preferences and a screen pops up asking if youd like to "Enable dither on playback." When Dither is added, a lower apparent level of noise is achieved by adding more noise to mask whats called quantization error, an artifact of converting an analog audio signal to digital. The added noise is introduced in a random manner that masks the patterns of the recordings nonrandom quantization error. As the years go by and I collect more and more high-resolution recordings, I wont want to have to get up from my seat to change my Macs MIDI settings every time I follow a hi-rez track with a "Red Book" track, or vice versa. Sonic Studios Amarra software solves that problem, but it doesnt stop there. Amarra sounds better than Apples iTunes, and includes some features that can make your entire audio system sound better than it ever has. Its built-in EQ can tame a nasty bass peak that has been obscuring fine musical details, and its Dither settings can make a so-so recording sound just a little bit better. Is all of this worth $995? For me it is. That may sound like a lot to spend on a computer program, but in high-end audio, $995 isnt all that much. If youre using a Mac as your hi-fi audio source, then I think Amarra is must-have. But dont take my word for it -- go to Sonic Studios website, test-drive the demo version, and decide for yourself.